Honestly, I scanned this entire article because I liked the title. The vocabulary of engineers or experimenters working with computers, synthesizers, electronic calculators and similar digital devices is replete with acronyms you should know. RAM is one, read on to find out what it is and how it’s used. ANY MEMORY IS A STORAGE DEVICE THAT is given some information at some time and hopefully will return that identical information at a later date for reuse at least once. The most elemental unit of a memory storage system is the cell which can store one bit consisting of a “1-0” or “Yes-No” simple decision. Memory cells are often grouped into words of several bits each. These words can represent the number in a calculator, an instruction command in a computer, a tone and its duration in an electronic music composer, an alphanumeric character in a TV Typewriter and so on. Memories can range from one bit to many billions of bits. The equivalent of the human memory is sometimes suggested as 10 billion bits while the longest memory you can buy in a single off-the-shelf integrated circuit is 4096 bits. There are several different types of memories. You usually classify them by when, how and how often you put information in them. A Read Only Memory (See “What is a Read Only Memory?”, Radio-Electronics, February 1974) has information put into it only once. It keeps the information inside it more or less permanently. Read only memories are often used for such things as square root, log and trig instruction microprograms in a calculator, for time-zone conversion in a digital clock and for many other situations where you always want the same response to your system. Some read-only-memory systems are called “table lookup” systems, for they provide an “answer” in the same way you would get it from a math handbook. A few read-only-memory systems can be altered, but not rapidly. This is done by erasing them with intense ultraviolet light and reprogramming them; others are altered with special voltage or current pulses. Sometimes these are called Read Mostly Memories. We could also theoretically have a write only memory that would accept information but never return it. Contrary to some misguided and uninformed industry jokes about WOM’s, these DO “exist and have a very specialized use in computer programming, particularly in data stripping and formating. Still, nobody really manufactures WOM’s. When you want a WOM function, you use one location of a read-write memory over and over again instead, never bothering to read it. The most versatile memory is one that you can write (put information into) and read (receive information from) rapidly and in any sequence. Magnetic cores are typically this type of memory, although by eliminating or not using the write current generators, we can also obtain a read only function. Most cores are destructively read out, meaning that the information is lost the first time you use it. You then have to perform a rewrite after read operation and then put the information back into the memory cells if you are going to use the information again. Most semiconductor memories are non-destructively read out in that you can accept information without physically altering the memory contents. If you must put the information in and get it back in one specified sequence, you have a sequential memory. Long MOS shift registers can make a sequential memory. These have traditionally been lower in cost than true read-write memories, but have disadvantages of being noisier and having to wait a long time for the information you need to come out. The more versatile read-write memory is one that you can read or write in any location at any time. This is called a Random Access Memory, or RAM for short. RAM’s can be made sequential simply by deciding that you want to access or address things in order. A memory is non-volatile if you can remove the supply power or stop moving the data around inside the memory and still hold the information. Magnetic core is usually non-volatile. Semiconductor read only memories are, of course, non-volatile. Most reasonable or available semiconductor RAM’s are volatile and you must keep the supply power up or you will lose information. Many RAM’s offer a reduced power mode where you can keep information for long times on battery power. In a few years, we can expect true non-volatile semiconductor RAM’s, but for now, you have to design your memory application in such a way that the information is either no longer needed or stored somewhere else than in a semiconductor RAM during power down times. This really isn’t nearly as bad as it seems for usually you can easily get around the problem one way or another. Often a mixture of ROM’s and RAM’s in a single system does the job. There are two basic types of semiconductor RAM’s. These are the static RAM and the dynamic RAM. Both of these are volatile and will lose information during power down times. The difference is that static RAM’s will keep their information so long as power is applied without reshuffling or refreshing the data while a dynamic RAM has to have its internal storage moved around occasionally, often at a 500-hertz rate or faster. Static RAM’s usually have a flip-flop cell for data storage. Once set or reset, it will stay in that state until power is removed or it is relr tten. Dynamic RAM’s usually use a capacitor for data storage. The capacitor will eventually discharge and thus the data must be moved or refreshed before it is lost. Dynamic RAM’s are normally far cheaper as you can pack a lot more bits onto a given size chip, but they add to the external circuit complexity and may take some elaborate timing to reliably get them to work. Thus, dynamic RAM’s are more suited for very large memory systems, those over 50,000 bits or so. Today, you can buy a 256-bit surplus static RAM for $2.56 and get the same thing new for under $6.00. A 1024-bit dynamic RAM runs around $5.00 surplus and under $12.00 new. Thus, we are talking prices right now of a penny per bit and under and projected pricing runs as low as one-tenth of a penny per bit. At this projected pricing, a minicomputer computer memory big enough to speak Basic or Fortran could be built for a memory component cost of $64.00 for 64,000 bits, perhaps arranged as 4000 words of 16 bits each. Simpler memory systems for things like terminals, electronic locks, music composers and a whole bunch of things nobody has thought up yet today should cost well under $20.00 and eventually should come down to $2.00. So, now is the time to start becoming familiar with these exciting new devices. A simple semiconductor RAM Let’s start with a rather small RAM and see what we can do with it. We’ll use the 7474 TTL dual type D flip-flop as shown in Fig. 1. We’ll start with a one-bit memory and then double it to two bits by using both halves of the package. In Fig. 1-a, we use half the 7474. This stage can store a “1” (often a high state around 3.3 volts) or a “0” (usually a low state around 0.5 volt). The stored value appears at the “Q” output. The opposite or compliment of the stored value appears at ‘he Q output. We have a data or D input and a clock or CL input. Information present on ‘he D line gets loaded into our memory at the time the clock goes from ground to a positive value. To enter information into our memory, we put the information on the D line. At that time, it does NOT go into the cell. At the instant we bring the clock line from ground to a positive level or from a TTL positive logic 0 to a positive logic 1, we actually load or write the information into our flip-flop cell. Whatever was on D at the instant of positive edge clocking gets loaded into the memory and appears at the Q output. We can watch or read our memory any time we like, but since a change may be produced during clocking, we shouldn’t be using or reading at that particular instant. We call the clocking interval the write cycle. Time spent looking at this particular cell’s output is called the read cycle. Normally, you don’t read and write simultaneously. You either execute a read cycle where you monitor and use the output of the memory cell or you execute a write cycle where you place new information into the cell. The 7474 will do a write or a read cycle in under 50 ns. Since nothing physically changes internal to the 7474 during reading, the readout is non-destructive and we can reuse the stored information hundreds or even millions of times if we like. A one-bit, one-word memory by itself isn’t too useful, although you can think of an alarm system as a one-bit memory and there are numerous other trivial applications. To do any really useful function, we most often need quite a few more bits of storage. Figure 1-b shows how you can use both halves of a 7474 to build a memory of one word of two bits. This is done by simultaneously clocking each half of the package and using both outputs at once. Thus we have two data input lines, two output lines and one write line. This organization is one word of two bits. In 1-c, we have the opposite, a memory of two words of one bit each. Now something new has been added. We have to combine or select which of the two memory bits is going to appear as an output. We also have to decide which of the two cells is going to have data written into it at any given time. This decision is called addressing. We now have to address cell A (a 0 on the address line) or cell B (a 1 on the address line). By controlling the address line, we select which memory cell is to be acted upon or read. The more cells we have, the more complicated the addressing will become. Note that we needn’t alternate memory cells if you don’t want to. You can address either cell in any sequence you want. Hence the name random access. Adding more bits We could use as many 7474’s as we like to build up any memory, but even at surplus prices, the 25( or so per bit and the large supply power and size will eventually get to us. The next step up is to use packages with more than two D flip-flops. Quad and hex latches, the 74175 and 74174 are a good choice. Figure 2 shows some memory circuits using these components. In Fig. 2-a, we have a 16-cell memory arranged as four words of four bits each. We have four data lines, four output lines and two address lines. These two address lines are binarily decoded (00, 01, 10 and 11) to get at the four possible memory cell locations. We might use this memory to store four BCD numbers as part of a computer or calculator. In Fig. 2-b, we use eight 74174’s to build a 48-bit memory organized as eight words of six bits each. This time, we have six data input lines, six output lines, and three address lines. The three address lines are decoded (000, 001, 010, 011, 100, 101, 110 and 111) to get at the eight possible locations of six cell groups. Since we can represent a letter, number, space or punctuation with six bits of the standard ASCII code, this memory could be used to store an eight character message. Suppose we had a 64-cell memory. How could we group the cells to obtain different combinations of bits-per-word and numbers of words? Figure 3 shows some possibilities. While each of these memories is 64 bits total capacity, the organization of each is different. In Fig. 3-a, we have one word of 64 bits each. We need zero address lines since we are always looking at the same word, but we need 64 input lines and 64 output lines. In Fig. 3-b, we have two words of 32-bits each. We now need one address line to select which half of the memory is to be written into or read from. There are 32 input leads and 32 output leads. The next combination of Fig. 3-c would be four words of 16 bits each. Here we need two address lines binarily decoded to select which quarter of the memory is to be active and there would be 16 input leads and 16 output leads. You can rapidly run down the other organizations. Figure 3-d gives us eight words of eight bits each. There are three address lines needed that are decoded one-of-eight to pick one-eighth of the memory for use and we have eight input lines and eight output lines. In Fig. 3-e, we have four words of 16 bits each. Four address lines decode one of sixteen and there are four input and output lines. Two words of 32 bits each take two input lines, two output lines and five address lines, the latter decoded one- of -32 as shown in Fig. 3-f. Finally, in Fig. 3-g, we have 64 words of one bit each. There is one input line, one output line and six address lines which are binarily decoded one-of-64 to pick which of the individual memory cells is to be interrogated. So, we have a wide choice of organizations to any memory. The more the bits, the more the choices. Which do we use? This depends on you if you are working with a large system and depends on the integrated circuit manufacturer if you are trying to get the job done with only one or two stock integrated circuits. Obviously, you organize the memory to suit the information you are trying to put into it. Four-bit words are common for BCD (binary coded decimal) number storage in calculators. Six-bit words are often used to store ASCII characters. If the full ASCII code, including transparent control commands and lower case and error detection is to be used, we have to up to eight bits per word. Or, we might like to use the remaining two bits to select a color on a color display. We could get one of four with two bits. Minicomputers tend to use 8-, 9-, 12-, 13-, 16-, 17-, 18-, 24- or 25-bit words depending on the manufacturer and the task the computer is aimed at. So, for system’s use, you pick the number of bits needed to do the job. On the other hand, if you are a integrated circuit manufacturer, you want to have the most reasonable package in your system. The majority of semiconductor memories only have ONE input line and ONE output line and address lines for one-of-N decoding, giving you organizations such as 256 one-bit words 1024 one-bit words, 4096 one-bit words, and so on. Occasionally a smaller memory may have four bits per word, to make working with BCD numbers easier. Other arrangements are rarely used and you usually add packages to pick up the total number of bits you want. Decoding All organizations in Fig. 3 have binary to one-of-N decoders on the address lines. If this decoder is internally provided in the integrated circuit as it almost always is, we have an internally decoded memory. If we must provide external address decoding as is common with magnetic cores, we need external decoding. External decoding is also needed when you have several memory packages that you are combining for a total storage. In this case, you use output enable or chip select lines to pick which package is to be used. Once selected, each individual package then goes on to provide internal decoding. For instance, with two IC’s we could simply tie their inputs and outputs together and drive the first memory’s chip select as an address line and drive the second memory’s chip select from the compliment of that line. Thus, we pick one-of-two memory IC’s and the chip selects give us a new form of addressing. If we tie four memories together, we use two new address lines, one-of-four decode them and then chip select only one memory at a time. Figure 4 shows how you can expand memories using the chip select system. Unlike magnetic cores and many older memory systems, the data input and output lines are completely separate with most new semiconductor RAM’s. This eliminates amplifier recovery problems, steering networks, “single port” problems and things like this. Figure 5 is a list of my choice of the best There are lots of different ways to classify semiconductor RAM’s. One grouping is based on the process used. Bipolar RAM’s include TI L and ECL logic. MOS versions include P-channel, (metal and silicon gate), N-channel, and CMOS types. In the past, MOS devices have almost always been slower and much cheaper. Some MOS memories are now as fast as TTL and most MOS devices will continue to be cheaper than bipolar for some time to come. MOS memories are further broken down into static and dynamic versions. Dynamic versions are much cheaper and much harder to use, particularly in experimental or very small system applications. Let’s take a closer look at some specific IC’s: 7489 The 7489 is a good choice for initial experiments with RAM’s. It is TTL and works off a single 5-volt supply. Organization is 16 words of four bits each as shown in Fig. 7. There are four data inputs and four data outputs along with four address lines. The address lines are four-line-to-one-of-sixteen decoded internally. Internal circuitry is arranged so that you store and read out the compliment of the input information. To read this memory, you apply a four-bit address to pick the slot you want to look at and then bring the memory enable line low. For instance, address 0101 selects the fifth group of four cells. Data appears at the output shortly after the address is stable. To write into the 7489, pick an address, input the compliment of the data you want to store and then briefly bring the write enable low. This loads the memory. One thing you have to watch very carefully in any semiconductor memory is that the address cannot be changed immediately before, during or immediately after a write command. (The definition of “immediately” varies with the IC—carefully consult the data sheets!) As a memory address changes, certain locations are “flashed” by in the decoding process. It is possible to write, erase or physically move data around if you aren’t careful. ALWAYS PULSE THE WRITE COMMAND ON ANY SEMICONDUCTOR MEMORY. NEVER CHANGE ADDRESSES DURING WRITE PULSING! Put another way, always leave the memory in a disable or a read mode. Don’t put into write mode until after the address is stable. This particular memory cycles in under 50 ns. If you are running any memory very fast, times will occur when the old information or wrong information will be put out until the answers settle down. If this “garbage” time is too great for your application, you can add a latch to the output (perhaps a 74174) to sample the output only during instants when you know the data is good. A very few new memory lC’s include internal latches and eliminate this problem. By the same token, if you are running fast, the ripple and gate times on address changes may cut into your cycle time significantly. Again, if you are running fast, it pays to either use fully synchronous timing or else latch the addresses to get them all changing at once. Some semiconductor mainframes get around the problem by using emitter coupled logic (ECL) and its very high speeds for addressing. The 7489 has a few obvious and apparently untapped electronic music applications. For instance, you can use sixteen four-bit words to completely specify one cycle of a music waveform, the attack-sustain-decay envelope of a note or a melodic sequence. These run around $3.50 surplus and under $11.00 new. Other TTL memories There’s quite a few other TTL memories available, some as long as 1024 bits. The 7481 is a very old design arranged as sixteen words of one bit each. The 74170 is called a 4×4 file, meaning it is a 16-bit memory arranged as four words of four bits each. The 74200 and faster 74S200 are a 256 x 1 memory or 256 words of one bit each. There’s also a bunch of “non-7400” TTL memories. The Signetics 8225 is a pin-for-pin replacement for the 7489. 1101 The 1101 is a MOS static memory arranged as 256 words on one bit each. It’s shown in Fig. 8. MOS memories are gener- ally much cheaper and often much slower than TTL ones. The 1101 works on +5, -9 supplies and runs quite hot. There is TTL compatibility on inputs, addresses and outputs. There are seven address lines, internally decoded to pick one of the 256 bits. There is one input line and two output lines, a normal one and its compliment. To read, you make the chip select low and the read/write low after applying the selected address. The output data will be valid within a microsecond or so afterward. To write, you select your address, wait 300 ns, bring the read/write line high for at least 400 ns and then wait at least 100 ns after the write line goes low before changing addresses. As usual, NEVER change the address during, before or immediately after writing. The 1101 is widely available and costs as little as $2.56 for probably good surplus units and as little as 50? for questionable surplus units. New cost is under $6.00. One possible application would to be using six of them in a data terminal or programmable calculator to store a 256-word message using the ASCII code. Improved 1101’s The original 1101’s were rather slow and could take as long as 1.5 ms to read. They are very hot running and the -9 supply is usually a rather wierd thing to have to provide. Improved devices are now available. An 1101A1 cycles in one microsecond maximum. The Signetics 25L01 and the Mostek MK4007-4P are second-generation, pin-identical, versions that cycle in under a microsecond, consume much less supply power and work on standard +5, -12 supplies. CMOS RAM’s One new type of 1101 replacement is the CD4061, a CMOS device made by RCA. This is a pin-for-pin replacement, but being CMOS, it takes only one supply and draws utterly negligible supply power if you aren’t writing or changing the address. Thus, you can use this with a very small battery for power down storage and still hold the information.You can also run on incredibly lower currents than the 1101 style devices and much faster as well—several hundred nanoseconds. This makes the 4061 ideal for hand-held data equipment and calculators, as well as meter readers and things like this. The only hitch—it’s a new device and still costs $40.00. Maybe next year. Other CMOS memories include the Motorola 14505 (64 x 1), the Solid State Scientific SCL5554 (256 x 1) and the Inselek A5503 (256 x 1). 1103 The main reason we include the 1103 here is as a warning NOT to try and use it-—unless you have lots of fancy equipment and considerable experience. This is especially true of surplus 1103’s. The 1103 is a 1024-word x 1-bit dynamic shift register. It is very low in cost. It ranks as the all time most successful single integrated circuit and it toppled “king core” from the computer world. The device trades a very simple and very dense internal circuit for quite a bit in the way of outside support circuitry. This IC needs critically controlled clocks, usually needs an output sense amplifier, and has a complex timing sequence so elaborate that a 30-ns overlap error in the wrong place will cause information dropout. The 1103 is eminently suited for large memories of at least 50,000 bits (this is tiny by mainframe computer standards) or so, where all the critical support circuitry is easily worked with and may be offset by the savings you get by cramming 1000 bits in each package. The 1103 uses capacitors for internal data storage. The data must be moved around or refreshed at least 500 times per second. The 1103 is obsolete today. There are some significantly improved devices available today that are much easier to use, but they still are a rather tough design problem if you do not have elaborate equipment and considerable digital know-how. Improved versions include the Intel 1103-A, the Mostek MK4006 and MK.4008, the Electronic Arrays EA1500 1501 and 1502 and the American Microsystems S3103. 4096 bits The big race today is to build an improved 1103-style integrated circuit with 4096 bits. At least one has been announced by TI at a 100-lot price of $26.00, or around 0.6cc per bit. The other manufacturers aren’t taking this sitting down and the race is on. Pinouts have pretty much been standardized and some should be available as you read this. Competitive products include the Electronic Arrays 1504, the Intel 2107A, Standard Microsystems 4412, Texas Instruments 4030, Microsystems International 7112, Mostek 4096, Motorola 6605 and probably a bunch more. Only eight of these integrated circuits are needed to build a decent minicomputer main memory. No an NFL team from St. Louis; Erstwhile L.A. I wonder what acronym could be made out of EWE? “I always thought someone should have come up with Electronically Writable and Erasable Random Access Memory – EWE-RAM”, he said sheepishly. Huh. 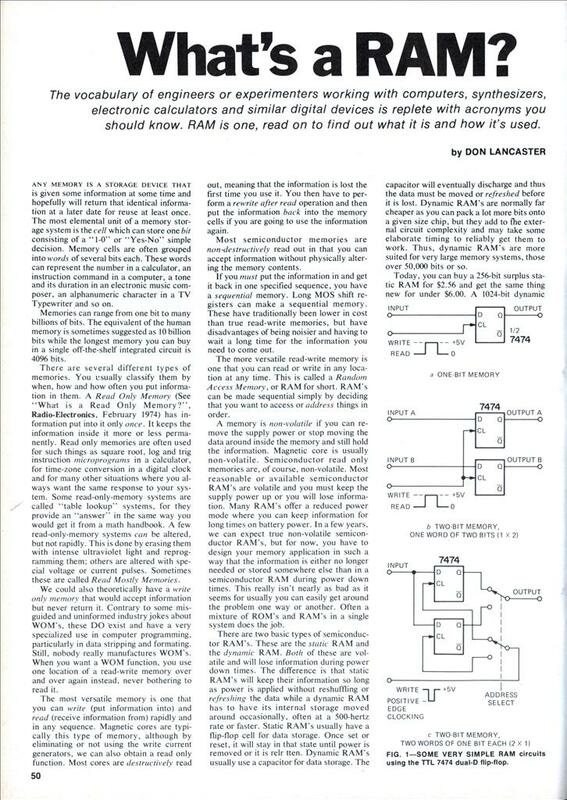 All my life I’ve heard that Don Lancaster wrote for Radio-Electronics, but only now realized I’d never read anything of his from this period. 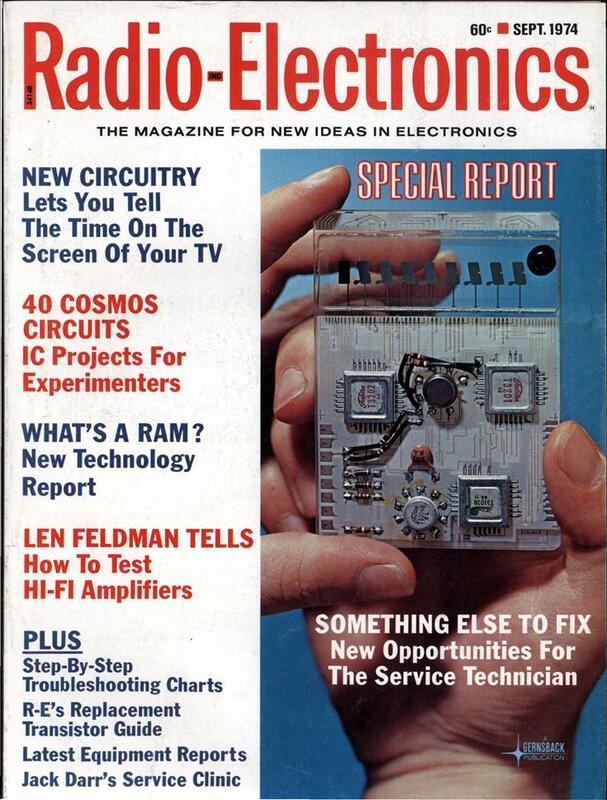 Talk about the right article at the right time… this is just what hundreds of electronics experimenters needed to read at this moment in history. Or maybe I should say, because of his articles, this moment in computer hardware history came to be what it was.